Termite damage is hard to detect because termites will eat and destroy wood from the inside out. For this reason you should pay special attention and watch for the early warning signs of termites. 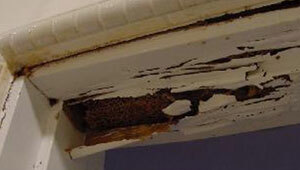 However, there are some very distinctive signs of termite damage. As termites eat though wood they hollow out tunnesl and “cathedrals”. This tends to give termite infested wood a hollow sound when you knock on it. Again, this destroyed wood is the hardest to find, but it is also where the most significant damage can occure. Picured is the type of damage that can happen over time. That used to be a solid 2×4. As you can see from the picture, there isn’t much left. Termites have hollowed it leaving only paper thin wood remaining. Damage this extensive takes some time. 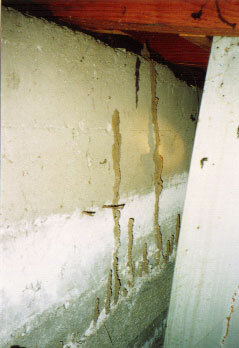 If caught early this type of termite damage can be avoided. Sometimes termites will dig to far and break though the wood. If it’s a small gap then they just cover the gap with mud and keep eating. Sometimes the damage will be so severe that an entire section of wood will just fall apart. As you can see from this picture of termite damage, the upper section of this doorframe was completely destroyed by termites. Subterranean termites may live underground, but to find food they have to leave their colonies to forage. This forging can take them far and wide, and it also takes them above ground. If getting from point A to point B requires crossing open ground, subterranean termites will build mud tubes to cover the open distance. These termite tubes serve several purposes. First is the termites need for moisture. The tubes shelter the termites from an open enviroment that could dry out their bodies. The next important function termite tubes serve is to protect the termites as they go back and forth from their colony to the food source. Ussually you will find these termite tubes running from the ground over a foundation to get to the wood part of a bulding. They can be a good sign of where the termite’s point of entry was. 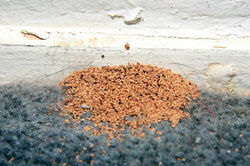 Termite pellets, or frass, are little balls of termite waste. 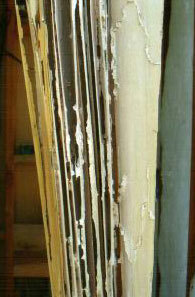 Drywood termites push their waste out of the colony from little “kick holes”. A kick hole will just be a simple hole in the wood. It will appear rather innocent, but an active kick hole will have an ever growing pile of termite pellets under it. This will be a sure indication of an active Drywood termite infestation.